Clifford C Jackson, Birmingham and Marysville MI. O-2 1933 = 2pOhwM; 125hp Warner Scarab; span: 31'0" length: 20'8" load: 525# v: 125/110/45. Full-span ailerons, Handley-Page wing slots; wood-clad, steel-tube fuselage, fabric-covered wood wings; ff: 1/23/33 (p: Cliff Jackson). POP: 1 [X12875]. Sold to Meyers Aircraft Co in 1941 for marketing, which failed to materialize, although Meyers used the name for publicity and it is sometimes seen listed as the Meyers O-2. The plane was scrapped after 236 hours flying time, but the wings and empennage were salvaged by Jackson with the plan of building a second version, but it never came to pass. Jackson Aircraft Corp (A J McCourtie), Reynolds Field, Jackson MI. B-2 1936 = 2pChwM; 40hp Continental A-40-4. Began as a fuselage and wings found in an Ohio scrapyard, then a well-used Continental was located, and the rest hand-made to fit. c/n 15. Dr Lewis A Jackson, Central State Univ, Wilberforce OH. J-10 1956 = 1p flying automobile with folding wings and pusher engine; span: 16'0"; data lacking. [N8072]. Versatile I 19?? = No data. [N9666H]. 1910: Multiplane Ltd (fdr: Henry William Jacobs), Atchison KS. 1912: Ended operations. Multi-plane 1910 = 4p four-plane experiment with two 35hp pushers (most likely Emersons), replaced by Jacobs' own motors*. Gross wt: 2000#. Made its debut at the New York Exhibition that year, and was described 20 years later in a retrospective: "Optimistic reports credited it with flight performances that would be marvelous even now (1930), but verification was inadequate." 1929: Jacobs Aircraft Engine Co, Pottstown PA. 1950: Helicopter Div formed. 104 Gyrodyne 1953 = 1pOH; 350hp Jacobs R-755; ff: 10/x/53. Evolution prototype for 5p helicopter. Eastman N Jacobs, 148 LaSalle Ave, Hampton VA.
1929 = 1pOhwM; Ace motorcycle engine. 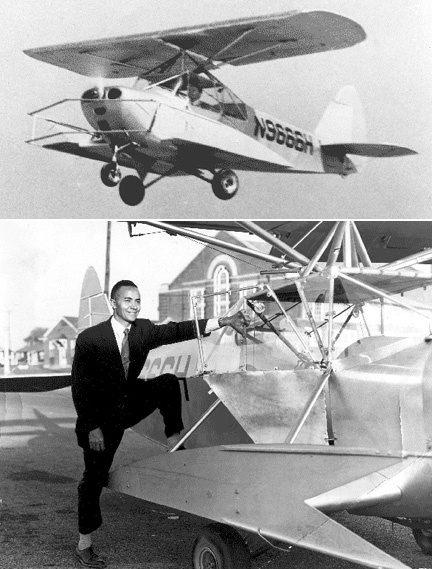 The later-renowned NACA scientist designed and built this ultralight in his own backyard and taught himself to fly in it. [361H]. Tin Goose c.1930 = 1pOlwM; 85hp DH Gipsy. 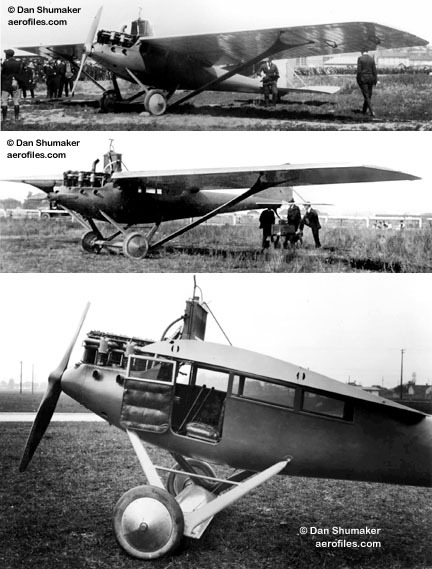 Despite its name, it was framed in wood, with plywood covered wings, with only the fuselage covered in duraluminum. Flight tested and won a local air race later the same day (p: Wally Arntzen) ; noted on some registers as Arntzen A.
Joe Jacobsen, St Louis MO. Imp c.1940 = 1pOB rg; unknown cowled radial. Short-coupled, short-wing racer with I-struts. [NX479W]. 1920: (Giocondos) Jacuzzi & Bros, 2043 San Pablo Ave, Berkeley CA (established by seven brothers to build propellers under military contract). c.1923: Jacuzzi Bros Propellers, 1450 San Pablo Ave.
J-7 Reo or Rio 1920 = 7pChwM; 200hp Hall-Scott L-6; span: 52'0" length: 29'0". $14,000; POP: 1. First cabin monoplane built in US, planned for use in mail and passenger service, made many successful flights, even attaining 14,000' on a trip to Reno NV. Destroyed in a fatal crash at Modesto CA after a wing failure on 7/14/21. Monoplane 1920 = 1pOmwM; 35hp Ford T. Semi-monocoque fuselage. POP: 1, built to investigate laminated wood construction methods. Made a few short flights, but experienced major cooling problems. 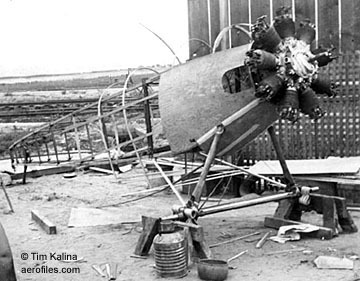 Repowered in 1922 with 50hp Roberts 4-X and with a redesigned tail, it never flew againduring its first take-off attempt the propeller touched the ground and shattered. Resulting vibration shook the radiator loose in a cloud of steam, and test-pilot Guy Coldwell abandoned the ship as it wobbled to a stop. However, all was not lostconstruction experience gained went into their larger monoplane. Jaffe Aircraft Corp, San Antonio TX. SA-32T Turbo Trainer c.1990 = Evolved from Swearingen SX-300. Richard J Jameson, Fullerton CA. RJJ-1 Gipsy Hawk 1972 = 1pClwM; 65hp Continental A-65; span: 18'8" length: 15'8" load: 300# v: 128/115/x. [N71RJ]. Plans were available to home-builders. William L Jamieson, Evansville IN and Richmond VA.
A 1930 = Unknown type home-built with Johnson conversion [503V]. Speed Wing 1933 = 1pClwM; 600hp Curtiss D-12. Squared fuselage was faired into the rudder. Racer reportedly lacked stability and flew only once, was clocked at 300mph . Jamieson was killed in air mail duty and his racer was never used. D-120, -160, -200, -300 1990 (Daytona) = 2-4pClwM; 120hp Lycoming (D-120), 160hp Lycoming (D-160), 200hp Lycoming (D-200), 300hp Lycoming (D-300); span: 36'0" length: 25'11" load: 1250# (D-200), 1900# (D-300) v: 201/190/59 (D-200), 207/195/67 (D-300) range: 1466 (D-200), 807 (D-300). 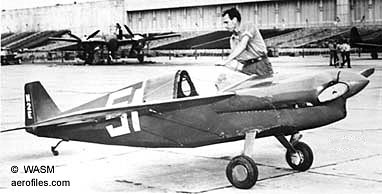 J-1 Jupiter 1948 (ATC 2-584) = 3pClwM rg; 108hp Lycoming O-235-C1; span: 29'0" length: 20'10" load: 800# v: 167/150/40. Post-war V-tail, metalized conversion of military surplus Culver PQ-8; also tried with 125hp Lycoming O-290. $2,500; POP: 4; one prototype [N1859M], 3 production [N61468, N41778, N41781]. J-2-L-1 19?? (TC 2A1, A3EA) = 108hp O-235-C1; range: 700 ceiling: 17,000'. No other data found, but an ad suggests a close similarity to J-1. Take 1, J 1962 = 4pClwM rg; 150hp Lycoming O-320-A3C; span: 29'0" length: 21'6" load: 995# v: 187/158/51 range: 1000 ceiling: 17,000'; ff: 12/13/52. Prototype [N39804]. Produced in small numbers in 1963 as Model J.
Janney Aircraft Co, Monroe MI. 1914: (Antony and Rodger) Jannus Aeroplanes, Battery Ave and Hamburg St, Baltimore MD; 1915: Toledo OH. 1916: Company dissolved to accept positions with Curtiss Airplane Co. Flying Boat 1914 = 3pOBFb; 120hp Maximotor pusher with chain-driven propeller; span: 45'10" (?>42'10") length: 28'0" load: 900# range: 240. Frithof G "Fritz" Ericson. 25'0" hull. Design based on Benoist 14. POP: 2. Flying Boat 1915 = 5pOBFb; two 160hp Curtiss V-2; span: 80'0". Jarvis Mfg Co, Glendale CA. 1946: Acquired by Volmer Jensen. VJ-21 Jaybird 1945 = 2pChwM; 75hp Lycoming O-145 pusher; v: 135/110/40 range: 400. Volmer Jensen. Pod-mounted motor nacelle; single gear with retracting outriggers, steel nose skid. Side-by-side cockpit. $2,500; POP: 1. Became Volmer VJ-21. XP-52 19?? = Home-built. 1pClwM rg; 125hp Lycoming O-290. Pasadena Aircraft Corp, Pasadena CA. Californian 1929 = 7pO/ChwM; 220hp (?>300hp) P&W Wasp or Wright Whirlwind. S C Parr. $14,000. Two pilots in side-by-side cockpit; full-width ailerons. [469E]. 1953: Javelin Aircraft Co, Wichita KS. Mullens Phoenix 1981 = 1pCmwM; 210hp Lycoming O-540: span: 63'0" length: 27'7". Developed from Bede BD-2 for long-distance record attempt. T200A 198? = On-station surveillance or TV relay aircraft. 1pCmwM; 200hp Lycoming TIO-360; span: 57'0" length: 26'6" load: 590# v: 218/158/58 range: 3600-4800 ceiling: 40-50,000'. V6 STOL 199? = 4pChwM; 230hp converted Ford auto engine; span: 32'0" length: 22'4" load: 950# v: 140/130/52 range: 650. 1929: Jayhawk Aircraft Mfg Corp (fdrs: W D Egolf, D W Eaton), 915 E Lincoln, Wichita KS. Mars 2 1930 = 2pOB; 100hp Kinner K-5; span: 30'5" length: 20'6" v: x/120/30 range: 500. Thomas M Finney. Folding taperwings. POP: 2 [X489N, X494N]. (Jack B) Stinson School of Aviation, 229 E Baltimore Ave, Detroit MI. Aircoupe 1928 = 2pChwM; 60hp Detroit Air Cat. 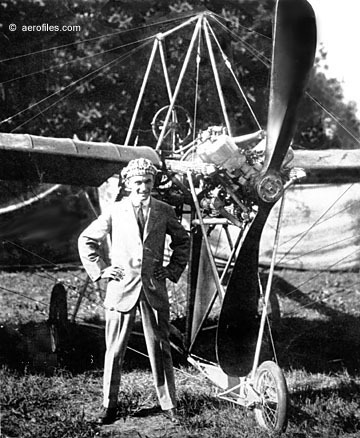 J B Stinson, as a personal venture for an aborted endurance flight. Built by students, it became the school hack. POP: 2 [X1511] c/n 3 and a 1pOhwM version with Detroit Air Cat, replaced by 60hp LeBlond [X7169] c/n 110. Jean Flying Machine Co. No location. 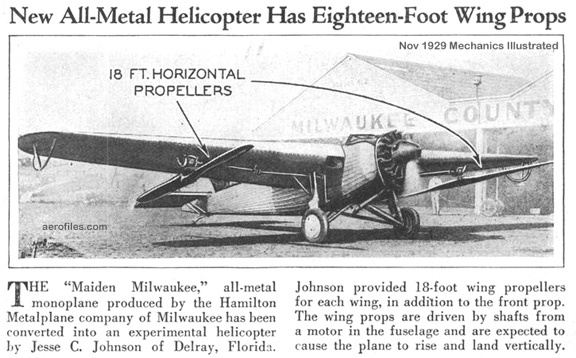 Helicopter 1909 = No data other than this had "rectangular frames with helices inside" and a 2-cylinder motor. Barracuda 1975 = 2pClwM rg; 260hp (prototype 220hp) Lycoming; span: 24'9" length: 21'6" load: 505# v: x/200/70. Geoff Siers. Wood and fiberglass construction. Received EAA's Most Outstanding New Design Award 1976. Marketed plans for $125; kits available from dealers. POP: 350 reportedly built by home-builders by 1982. RC Junior 1919 = 1pOB; 35hp Jennings; span: 28'0" length: 16'3" load: 240# v: 74/x/37. 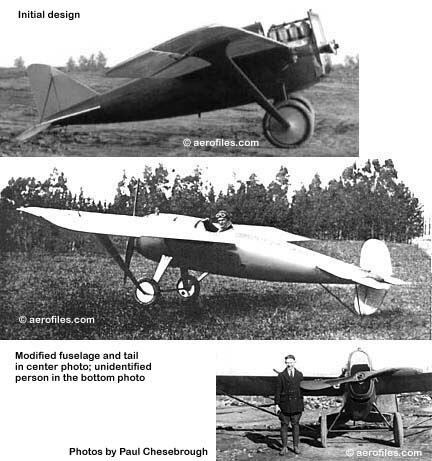 Sportplane 1919 = 1pOB; 38hp Ford A; span: 28'0" v: 80/x/37. Advertised as a home-builder project in kit or plan form. The difference between this and RC Junior is unknown. Martin Jensen, San Diego CA. 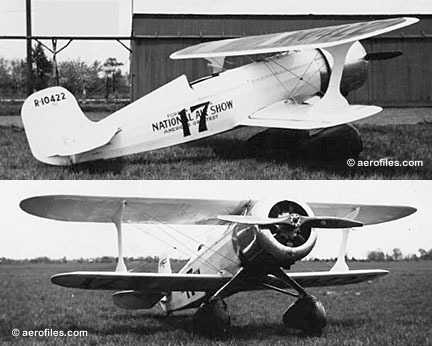 1928: Jensen Aviation Corp, Lehighton PA. 1929: Jensen Aircraft & Marine Corp, Albany NY. 1930: Beckley College, Harrisburg PA. 1936: Jensen Aircraft Corp, James Island Airport, Charleston SC. c.1949: Jensen Helicopter Co Inc (fdrs: M Jensen & Chandler Hovey), Tonasket WA. 3-LW 1939 = 2pClwM; 60hp Franklin 4AC. POP: 1 [NX18157]. JT-1 1929 = 2pOB; 100hp Kinner K-5. "JT" for "Jensen Trainer." POP: 1 [281V]. Production of which was halted by the Depression, but design evolved into Sport Trainer. "Jumping June Bug" 1926 = 2pOB; 220hp Wright J*; span: c.34'0" v: 150/x/38; ff: 5/28/26. Pieced together from parts of Curtiss JN-4, Blackburn Swift, and other scrap-pile gleanings. * The engine itself was assembled from Navy surplus Whirlwind parts, as well, and the aircraft was designed backward from it. Used by Jensen and his wife for a Western barnstorming tour. Model 21 c.1949 = 2pCH; 125hp Continental C-125; rotor: 27'0" load: 500#. Design evolved into Lift Systems LS-3. Sport Trainer (Harrisburg) 1930 = 2pOB; 225hp Wright J-6; span: 30'0" length: 22'2" load: 580# v: 120/105/35. POP: 2 student projects under the guidance of Jensen, then head of Beckley College Aviation Dept [X/NR11680, x]. 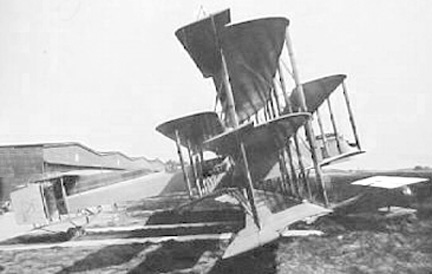 Equal-span wings made from Curtiss JN-4D parts. Original power was 120hp Martin 333; subsequently refitted with 145hp Warner c.1932 (length: 22'3" load: 700# v: 125/105/30 range: 300), and 100hp Ford V-8 in 1936. Scrapped c.1937. John L Brown, Momence IL. 1922 = 1pOmwM; chain-driven motorcycle engine. Home-built with semi-cantilever wing. (Walter E) Johansen Aircraft Co, 4556 W 16 Place, Los Angeles CA. JA-1 c.1934 = 2pClwM; 40hp Continental A-40; span: 35'8" length: 21'7" load: 440# v: 95/85/38 range: 250. Side-by-side cockpit. $1350. 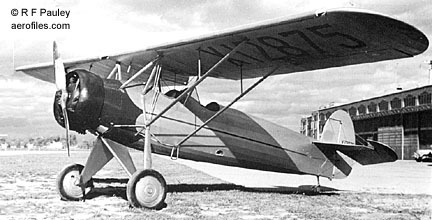 Possibly was modified as JA-2. JA-2 1934 = 2pClwM; 40hp Church; span: 16'0" length: 14'0" v: 95/85/30 range: 250. Pancake wing design (* see following) for slow-speed, stall-proof operation was described, but photo appears to have a rather normal wing (note "C" in tail number X-ed out). [NX14926] c/n 201. Advertised with 40hp Continental for $1,450. JA-3 1940 = No data, perhaps a design study only; appeared in 1942 Aerosphere showing JA-2 specs and registration, and in an "unusual planes" magazine feature with JA-1 specs and a photo showing a conventional wing, and a tail with JA-2's number [NC14926]. American Multiplane Co, Bath NY. Multiplane 1919 = Odd visual effect with what appeared to be one-and-a-half biplane fuselages and wings joined in tandem, with a triplane inserted in the middle, all of this propelled by one Liberty motor in the nose and two more as interwing pushers. Herbert Johns. Needless to say, it was huge. After several hopping tests, the septi-wing just barely cleared the ground on its test flight before nosing up and settling ungracefully. When more attempts in 1920 proved conclusively that the machine was not particularly interested in flying, it was scrapped. Alvis R "Ray" Johns, Orrstown and Chambersburg PA.
1934 = 1pOhwM with 25hp Harley-Davidson motor, with which Johns taught himself to fly in a series of short hops around the family farm. Green Demon 1940 = 2pOhwM; 65hp Ford A; span: 32'0" length: 17'0" v: 110/100/60. Empty wt: 550#. The airplane was not registered, but Johns didn't care because he didn't have a license, either. 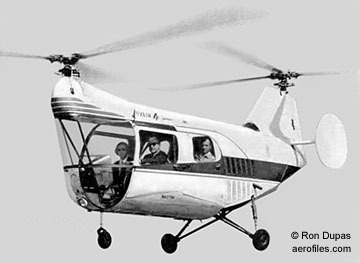 KJ-1 Air Sport c.1969 = 1pOhwM; 50hp Continental; span: 32'0" v: 135/95/55. Empty wt: 516#. [N3326]. Tornado J-V 1973 = 2pOB; 125hp Lycoming. [N56AJ]. X-3 Rason Warrior 1950 = 5pClwM; 185hp Lycoming O-435; span: 38'0" length: 23'7" (?>23'6") load: 1630# v: 140/135/40. Ray Johns, Paul L Witmer. Bulky-tailed, wide-chord plane with fully-panted wheels. Short fields a specialty, take-off in 350'; convertible to cargo carrier [NC1528Y]. EAA award for Achievement 1963.
c.1905: (Clarence, Harry, Julius, Louis) Johnson Brothers Co, Terre Haute IN. 1908: Johnson Aircraft Building Shop. 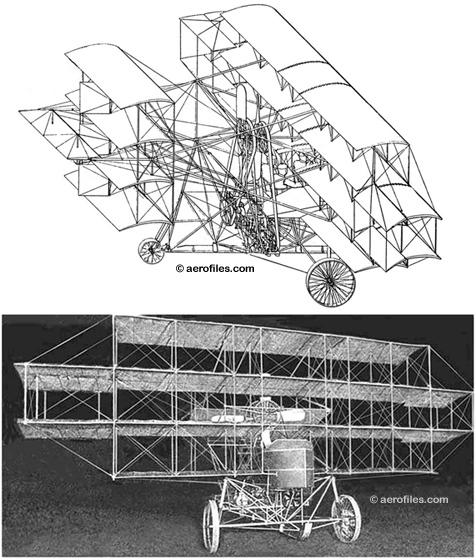 1908 = 1pOmwM; 40-60hp Johnson V-4 Aero Motor; span: 36'0" length: 34'0". Looked a little like an oversized Blériot of wooden construction. It got a few feet off the ground on its first and only flight, but was judged unsafe. 1911 = 1pOmwM; 40-60hp Johnson V-4 Aero Motor; span: 36'0" v: x/60/35; ff: 8/8/11 (p: Lou Johnson). An improved, stronger version of the previous; steel-and-aluminum tube frame with wood ribs and a tricycle gear. Flown with success around the Wabash River country at Menom IN during the summers of 1911-13 by Lou Johnson and exhibition pilot Ross Smith. c.1922: (E A) Johnson Airplane & Supply Co, Dayton OH. c.1924: Driggs-Johnson Airplane & Supply Co. 1927: Filed for bankruptcy. Canary 1925 = 3pOB; 90hp Curtiss OX-5. POP: 1. Possible reworked JN-4D. DJ-1 SEE Driggs-Johnson DJ-1 for data. Twin 60 1926 (ATC 3) = 2pOB; two 32hp Bristol Cherub pusher; span: 28'0" length: 21'0" load: 520# v: 75/60/25 range: 480; ff: 12/18/26. POP: 1 ; perhaps a second one was built in 1928, registered as such , but no records verify this and it might be a re-register or an uncompleted model. Even with two motors, the Twin 60's gas consumption translated into an economical 24mpg. Destroyed in a crash in June 1927 at Bettis Field, Pittsburgh PA.
-Hartzell FC-1, -2 1923 = 2-3pOB; 90hp Curtiss OX-5. Frederick Charavay. Also noted as Hartzell-Johnson. POP: 1 each [2465, x], of which the first was christened Fort Wayne Hartzell. There were other planes registered in the individual name of Hartzell, but with no model designations, and might have been JN-4 conversions. Clarence M Johnson, Detroit MI. 1927 = 2pOhwM; Anzani, replaced in 1932 by Velie M-5; span: 28'0" length: 20'0". 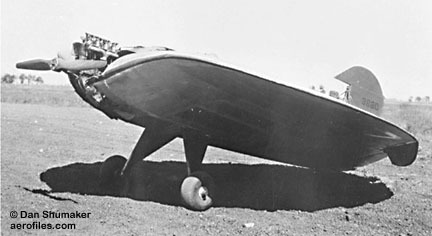 c/n JM-1; reg cancelled 7/12/34. Possibly a Pietenpol Air Camper? Design work by Johnson with draftsman Dwight Huntington; Johnson had been a welder with Curtiss-Wright and Detroit Aircraft. 1928 = 2pChwM; Hisso A; span: 37'6" length: 25'6". Likely could be a Standard converted by mechanic Johnson. s/n 1; reg cancelled in 1940. Jesse C Johnson, Milwaukee WI. 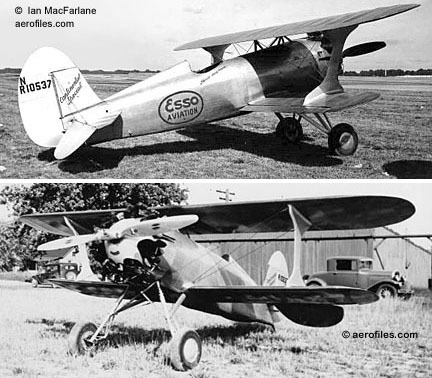 1929 = 1p gyroplane/helicoplane. Rotor-equipped Hamilton H-18 Metalplane had 9' propellers mounted horizontally under its wings. Johnson's address is given as West Palm Beach FL, but tests were performed in Milwaukee: "The craft took off after a short run of 75'. In the helicoplane mode, power to the tractor propeller was halved and the lateral screws started. The combination produced a steep angle climb. Johnson called the tests '90 percent perfect'." Richard B Johnson, 826 S Wabash Ave, Chicago IL. Uni-Plane 1934 = 1pO flying wing; 41hp Church Marathon; span: 14'0" length: 16'6" load: 270# v: 63/59/23. 3'0"-thick circular wing built around a Church Mid-wing fuselage; original version had a simplified two-control system with no ailerons. Twin tails on prototype were replaced by a single Alexander Eaglerock tail. POP: 1 [X13680]. US patent #1,887,411 awarded to Johnson on 11/8/32. Uni-Plane apparently had trouble feeling at home in the air, and for two years made more than 100 short, stright-line flights, many of which ended in one form of crash or other. Offered to Chicago meat packer as a "flying ham" advertisement during the World's Fair, but rejected after it crashed on take-off in Aug 1934. In 1936, a final and spectacular crash slammed the lid on things, and Johnson traded what was left for his hangar rent. 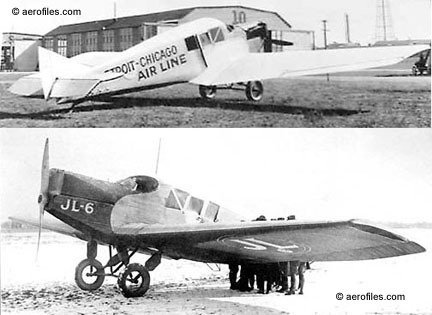 c.1935 = 1pO wingless airplane that a picture caption in Jan 1936 Air Trails explained: "... employs airfoil sections rotating on belt above fuselage for lift, and skirt for banking." Judging from the picture, it seems that a series of airfoils were rushed forward by the belt, then carried back again inside the fuselage for a new run, much like steps on an escalator. Why didn't anyone think of that before? Concluding caption: "Engine failure delayed tests." Perhaps mercifully. Buford E Johnson, Portland OR. 1935 = 2pOM; 65hp Lambert-Velie M-5. c/n 1. Sold 11/9/41, reg cancelled 7/19/48 when "owner failed to comply with CARs." Carroll L Johnson, Madison WI. 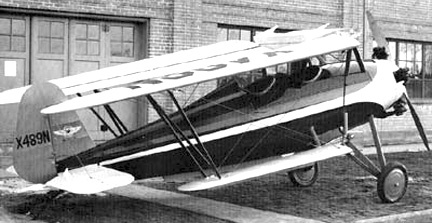 A 1935 = 2pOM; 40hp Ford A. .
Laird Aircraft Co & Harold Johnson, Dayton OH. Continental Special 1937 = 1pOB; 220hp Continental. Laird LC-DC modified as I-strutted aerobatic plane for use in Johnson's National Air Shows touring group. POP: 2 [NR10537] The Rocket and [R10422]. A C Johnson, Long Beach CA. 1941 = 2pClwM; two 80hp Johnson-designed motors in tandem in a split nacelle, facing one another. Almost a low-winged Seabee look to it, little was documented about this radical tractor-pusher design, and the theory of two opposite-turning propellers face-to-face a foot apart leaves one wondering. JR-1 1947 = 1pCmwM; 85hp Continental; span: 15'2" length: 15'9". Midget racer was destroyed in a crash July 1947. 1941: (Rufus S "Pop") Johnson. 1946: Rocket Aircraft Sales Corp, Henderson TX. 1945: Aircraft Inc or possibly Aircraft Mfg Co (qv), Fort Worth TX. Bullet 1945 = 2pClwM rg; 125hp Continental; span: 28'0" length: 21'1" load: 628# v: 160/x/48 range: 600. Ultimately became 4p Regent Texas Bullet. SEE Pop Johnson and His Rocket for the rest of the story. Rocket 125 1942 = No data. Rocket 185 1945 (ATC 776) = 3pClwM rg; 185hp Lycoming RO-435; span: 30'10" length: 21'10" load: 775# v: 185/160/60 (?>207/185/x) range: 690; ff: 8/x/45. R S Johnson. $5,900; POP: 19. Two-control system, with rudder used only in taxiing and take-off. Design became Regent Rocket. Special 1948 = 1pCmwM; 85hp Continental C-85; span: 17'4" length: 16'4". Luther Johnson. POP: 2 midget racers Idle Hours [N5E] and Carolina Aviation Betty Jo (p: Charles Barton) [N2E]. Appeared in 1949 races as Sheldon Special (p: L C Sheldon). Special 1949 = 1pClwM; 85hp Continental C-85. Midget racer designed and built by Dave Long as a Midget Mustang (qv). Metal fuselage. [N5111H]. Missing Link 1926 = No data; 2-cyl Lawrance. First of several homebuilts by Johnston. Special 1962 = 1pClwM; 108hp Lycoming O-235C; length: 22'7" v: 115/95/40; ff: 5/x/62. 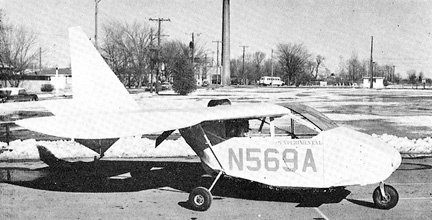 Modified from Long Wimpy and Taylorcraft BC-12. [CFRDH] c/n 1. Was 14 years in construction, cost: $2,500. Jeaco 2 1955 = 1pChwM; 80hp Continental A-80; span: 21'10" length: 18'0" v: 100/90/x. Empty wt: 622#. Constructed at El Centro CA. [N17K]. 1912: Johnstown Monoplane Co, Johnstown PA.
1912 = No specs or data found, only a news item that "a 100hp Gnome motor had been ordered." Incorporators were C E Dover, A L Gettys, Carl Heinz, A E Hiteshew, H E Slick. Gerald Jonas, San Francisco CA. Hummingbird 1977 = 2pCmwM canard; 78hp VW Revmaster; span: 20'4" length: 10'0" load: 415# v: 240/220/64. First flight was expected to take place in Oct 1977, but is unrecorded if it ever flew. Harry Martin Jones, Providence RI and Quincy MA. 1914 = 1pOBFb; 75hp Sturtevant chain-driving two three-bladed pusher propellers; ff: 6/9/14. Described as a Jones-designed boat hull "with Wright wings." Destroyed in a crash at Narragansett harbor on 9/9/14. 1915 (Quincy) = 3pOB; 80hp Sturtevant. 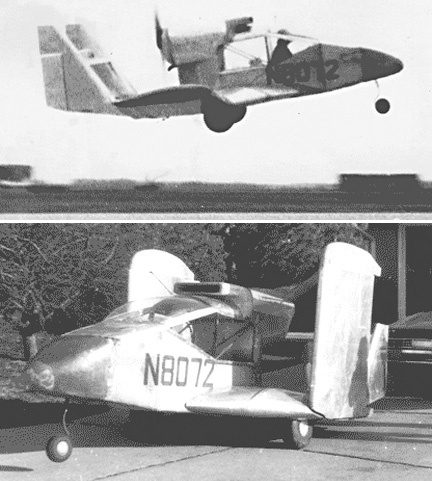 Fuselage-type tractor, also "with Wright wings." Sucessful as a trainer in Jones' flight school operations, but it, too, finally crashed. 1916 = OBFb; 80hp Sturtevant pusher. Little known about this one, but the only photo extant showed it to be a very handsome, rakish redesign of his 1914 flying boat. 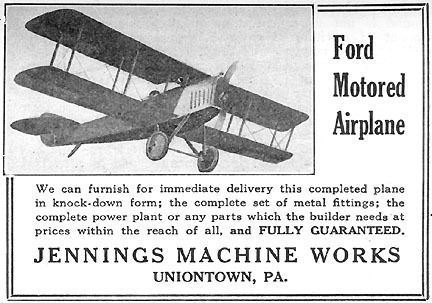 After this one, Jones quit building aircraft and went to work at Sturtevant Co as Grover Loening's assistant. George W Jones, 924 Camp St, Indianapolis IN. Suicide Buggy #1 1933 = 2pOlwM; span: 22'0" length: 17'0" v: 110. A letter with a construction photo published in Feb 1933 Popular Aviation explained: "I am the same little colored fellow who wrote your mag a short time ago ... I work for an undertaker, although I prefer aviation and expect to make it my life's work if I ever get into it ... We are all through and ready to put [the plane] together at the airport." Aerofiles welcomes more information about this home-built by Jones and his "two pals" with such a bleak and, hopefully, not predictive name. 1937: (Ben) Jones Aircraft Co Inc, Schenectady NY, on acquisition of rights and inventory from Metropolitan Aircraft Corp; 1938: Saratoga NY. 1938: Sold assets to White Aircraft Co, Leroy NY. D-25 aka Jones New Standard 1937 = New Standard D-25 from Metropolitan Corp inventory converted to crop duster. 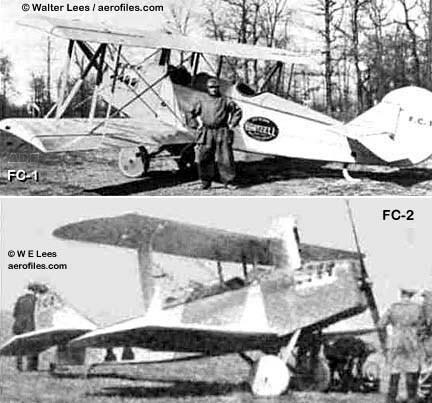 POP: 5 [19155/19157, 19197/19198], plus five more unassembled airframes and tooling sold to White Co.
S-125, -150 1937 = 2pClwM; 125hp Menasco C-4; span: 31'0" length: 24'2" load: 875# v: 151/136/x range: 730; (as S-150 with 150hp Menasco C-5). Canopied tandem cockpits; full-panted gear. POP: 1, badly damaged in a crash on its first test flight [X16791]. Rebuilt by White Co in 1938, and rechristened White S-125. The ultimate disposition of this rather handsome plane is unkown. Howell "Nick" Jones, Augusta GA.
Half Fast c.1965 = 1pCmwM midget racer. Took third place in finals at 1966 Los Angeles races. Destroyed in midair collision, from which both pilots escaped. POP: 1 [N4762S]. Linwood F Jordan/20th Century Aerial Navigation Co, Portland ME. 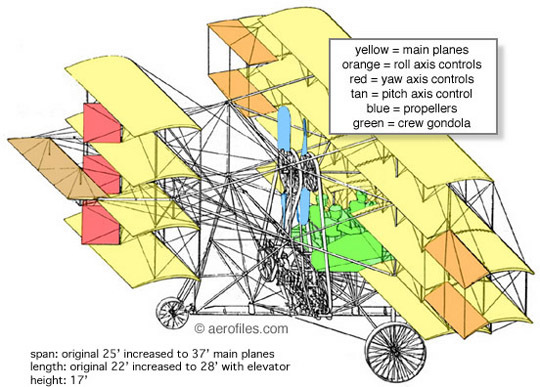 1914 = An oscillating-wing triplane, probably one of the last bird imitators. Unknown if this creation, named "Maine Dirigo" on its tail in a drawing, ever got off the ground, or even the drawing board. F A Joslin, Beaufort SC. Chiisai Tanyoki 1969 = 1pClwM. Two-third scale Mitsubishi A6M5 WW2 fighter. Helicopter Engr Research Corp (pres: D K Jovanovich), Boulevard Airport, Philadelphia PA (company principals were formerly with Piasecki Co). 1951: Acquired by McCulloch Motors Co. 1957: Jovair Corporation. 4A, 4E Sedan c.1960 = 4pCH; 210hp Franklin 6A-335; rotor: 23'0" length: 18'0" load: 840# v: x/90/0 range: 180 ceiling: 8000' (data for 4E). Twin tandem rotors. 4E was developed from JOV-3, 4A was 2p flying-framework version for agricultural and training duties. Program taken over by McCulloch in 1969. J-2 1962 = 2pCAg; 180hp Lycoming O-360 pusher; rotor: 27'0" length: 16'0" load: 549# v:125/110/30 range: 300. Three-bladed rotor; twin booms, twin tails. Produced by McCulloch from 1971, then by Aero Resources Inc from 1974 as Super J-2. Prototype [N4068K]. JOV-1 1946 = 2pCH; Lycoming; rotor: 26'0" load: 480 v: 100/x/0 range: 100. JOV-3 1949 = 2pCH; 100-125hp Franklin 4V; rotor: 18'6" length: 26'4" load: 423# v: 100/73/0 range: 138. D K Jovanovich; ff: 3/20/49. 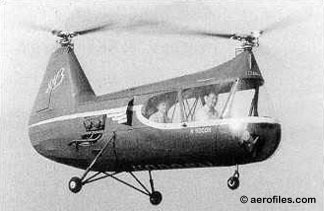 Twin three-bladed rotors fore and aft; tandem seating. Became McCulloch MC-4 in 1951 [N9000H]. (Ervin & Lyle) Joy Aircraft Co, 6359 N Lombard St, Portland OR. J 1933 = 2pOhwM; 40hp Salmson AD-9. POP: 1  c/n 1; undescribed, but likely was the prototype of JX. JX 1935 = 2pOhwM; two 40hp Salmson AD-9; ff: 4/23/38 (p: Sidney Monastes). Fishlike, wingless creation referred to as a "flying flapjack," with underslung motors, didn't make it past the barbed-wire fence at the end of the airport. Monastes was unhurt, but that couldn't be said for his flapjack. POP: although this had c/n 5, registration concurrency with model J suggests there was only 1 built . Vincent J Junglas, Rensselaer IN. 1935 = 2pOM; 35hp Ford T .
Junkers-(John M) Larsen Aircraft Corp, NY. JL-6 1920 = 5-7pOClwM; 185hp BMW; span: 48'7" length: 28'9" (?>31'7") v: 101 ceiling: 16,600'. All-metal. License-built by Junkers of Germany. POP: 8 to civil and air mail companies, 3 to USN [A5867/5869, A6696] and 2 to USAAS [AS64121/64122] for testing at McCook Fieldno military designations were assigned to USN and USAS planes. Set a world endurance record on 12/29/21, of 26h:19h:07s (p: Lloyd Bertaud, Eddie Stinson) over Long Island NY; plane carried 350 gallons of gas and 23 gallons of oil for a total weight of 5600#, and the flight was made in a snowstorm. JL-12 192? = 2pClwM; 400hp Liberty 12; span: 49'0" length: 32'0" load: 2000# v: 140/x/55 range: 400. A novel approach to troop strafing, the armor-plated plane sported 30 downward-aimed Thompson .30cal submachine guns fired selectively by the gunner, each stocked with 300 rounds of ammunition. POP: 1, created no interest with the military. J-1 1958 = 1pClwM; 65hp Continental; span: 21'0" length: 17'4" load: 283# v: 160/120/58 range: 300 (?>420). Wood construction, laminated-fiberglass covering. Won EAA Design Award 1959. K-2 1963 = 2pClwM; 125hp Lycoming O-290-G; span: 22'0" length: 17'4" load: 540# v: 160/140/55 range: 400. Skin-stressed laminated-fiberglass construction. [N1044Z].